The injurious Cheerio | spifftacular. This is the story of my first broken bone. Little Lars was sitting on the kitchen floor, and I was about three feet away in the dining room, perhaps picking up after lunch. Dave was in the other room. Usually I’m fine with Lars hanging out in the kitchen–he likes to bang the cupboard doors, empty said cupboards, and play with the colanders and Tupperware. 1. 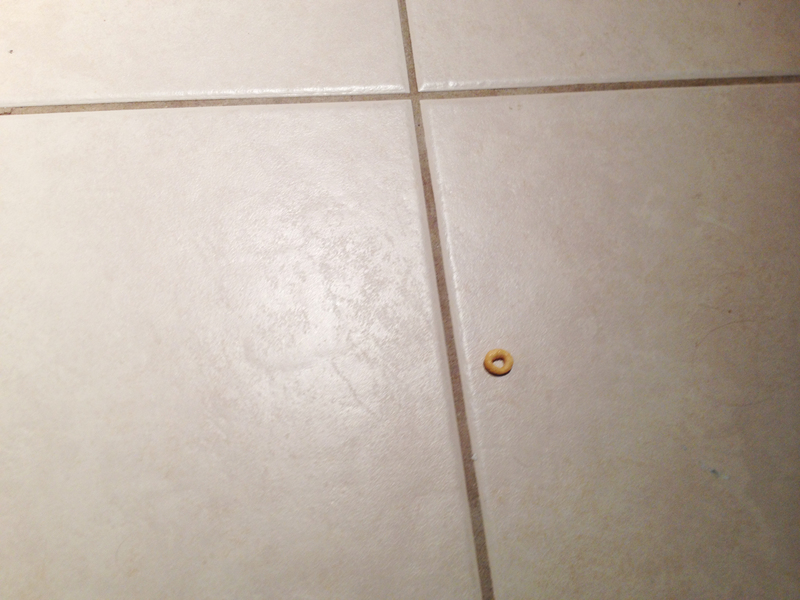 Lars picks up a rogue Cheerio from the floor. 2. My brain screams GERMSGERMSGERMS. 3. I dive toward him in the most agile and graceful fashion. 4. In my effort to avoid hitting the high chair that blocks my path, I ram my foot into the side of the dishwasher. 5. I frantically fish the Cheerio out of Lars’s mouth because I’ll be darned if I didn’t dive for nothing. 6. I start howling from pain in my pinky toe. 7. Lars, startled by his diving, howling mother, starts crying too. 8. I yell to Dave “We’re fine!” so he doesn’t think we are dying but he nonetheless rushes into the room. 9. I whine and limp for a week and a half, and even fly cross-country, before getting my act together and going to the doctor. The pinky toe is broken. I get gauze to tape together my pinky toe with the next toe, a boot, and instructions to walk as little as possible. On the bright side, we went to Disneyland last week and I got to be pushed around instead of trudging through the Anaheim heat. It also got us toward the front of the line for a few rides, though Disneyland’s wheelchair policy isn’t as liberal as it used to be (probably due to not-so-injured people abusing it). Over the past few weeks, I have recounted the story many times, and each time I have to acknowledge that yes I know I overreacted and I’m sure he would have been fine eating the Cheerio off the floor and it’s not the first time he would have eaten something off the floor anyway. Although it is pretty typical for me to overreact to something like this. Now I guess I’ll try to use non-diving methods to clean my kitchen floor. I’ll do it for the children. And for my pinky toe. The Elf gif made laugh out loud! Funny post! Thad once found a tiny dog poop pellet and popped it into his mouth. Ease up there momma!